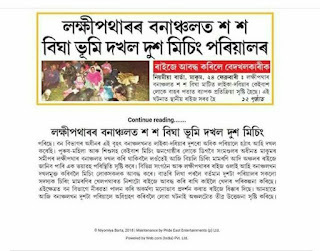 2001 Nobel Laureate Joseph Stiglitz of Columbia University,USA ,former chief economist of World Bank ,who was in Assam, visited Buruli,considered as Mising tribe's last traditional habitat in the north bank of Brahmaputra,especially two Mising villages named Baligaon and Bukagaon at Balipara in Sonitpur district of Assam yesterday,according to a local newspaper in Assam.It is also noteworthy to mentioned here that Stiglitz who was coming with his wife and nephew even took dinner delicacy in one Mising village the previous night.He was treated with the tribe's local recipes.According to the local daily of Guwahati,he also visited Nameri National Park located in the vicinity and took taste of various local recipes. (Hope,Stiglitz was treated with namsing, rasor or amin oying in the Mising village,our favorite recipes! 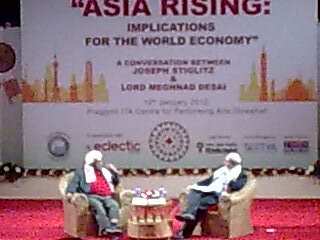 ).He took stock of Mising people's village economy and also visited a weekly market.All he toured for hours on foot!A top official of the government of Assam who accompanied Stiglitz said in a huge gathering minutes before where conversation between Joseph Stiglitz and Meghnad Desai was held. (Let's hope our Indian planners/intellectuals tour the villages the way Stiglitz did. )He also significantly pointed out that he felt flood prone state like Assam should not go for big dams instead choose for micro hydro projects.He delivered talks in Guwahati along with Meghnad Desai of London School of Economics on Asian economy . Both Stiglitz and Desai were invited by Youth Forum on Foreign Policy(YFFP),an organization formed by Assam chief minister's son Gaurab Gogoi along with his friends to focus decision-makers traverse from center of powers to the less highlighted region like landlocked northeastern region of India.YFFP said that they would take such steps by inviting top personalities of the world in the future too. Agom kéba:do Jonai gíyén ajona?